Skype for Business arrived in April as a replacement for Lync, but so far it’s been limited to desktop users. That changes today with the announcement of a preview app for iOS and Android. The app differs from the standard Skype offering by featuring your contacts, recent conversations and upcoming meetings all on your dashboard; the normal Skype app just shows you recent conversations by default. You can search for contacts right from the dashboard by first name, last name, alias or phone numbers, and on iOS your phone contacts are automatically included in search as well. For upcoming meetings, you an click through to read more information, or click ‘Quick Join’ to enter an ongoing session immediately. The calling experience is also a bit different, with larger buttons for muting, adding participants and managing your calls. Switching between video and text is also easier, as you can now have the option to see both on screen simultaneuosly. IT admins can sign up for the preview at a dedicated preview page, where they can nominate eight iOS and Android users (up to four of each) to try out the preview. You’ll have to apply by this Friday to be part of the first batch of users. 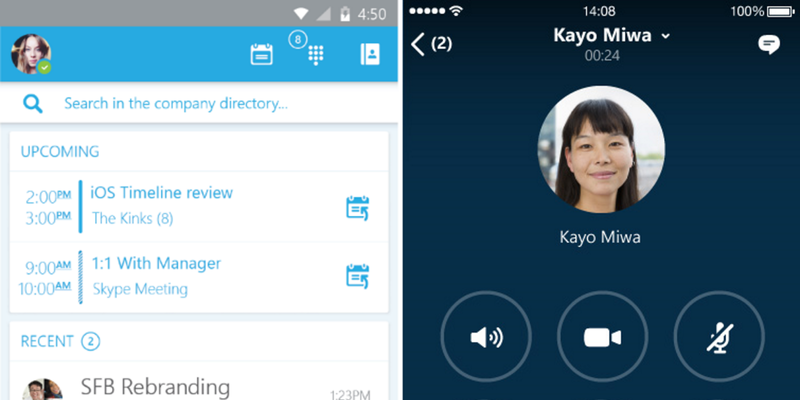 For everyone else, Skype for Business will replace the Lync 2013 app on iOS and Android later this year.